Research from InPhase suggests that on average a UK public sector body will annually spend between 2FTE and 10 FTE in creating reports from which better decisions can be made. In some cases as many as 10,000 different reports were being produced. The estimated cost of this is between £100,000 - £1million per organisation per year. Whilst this might seem high, if it’s being used to ensure schools are well managed, at risk children are protected, and the elderly receive meals regularly, then we realise that actionable information is a critical part to delivering efficient, improving, effective services. What is worrying is that not all reports carried consistent data. This gives mangers conflicting messages and undermines the value of the information in the first place. InPhase already delivers a consistent platform for managing a business holistically. The company’s latest innovation is designed to dramatically reduce the cost of Word and hard copy report production. It enables managers to set up a report just once and update it automatically direct from the one version of the truth of data and priorities. Available today, the InPhase Word Add-In lets you build a report using your current Word skills but the simple point and click interface embeds your latest data directly from the InPhase solution. You can drop in thousands of different visualisation styles from traditional charts and tables to infographics, geospatial data and scorecards. This process eliminates the need for screen-grabbing or cut-and-paste, or exporting of data and images into Excel. Refreshable on any date you can choose to see how the report looked yesterday or last week or month. Incredibly, you can then crop, move and stylise your charts just as you would a normal image inside a word document and they can still be refreshed with up to date data with their connection to InPhase. 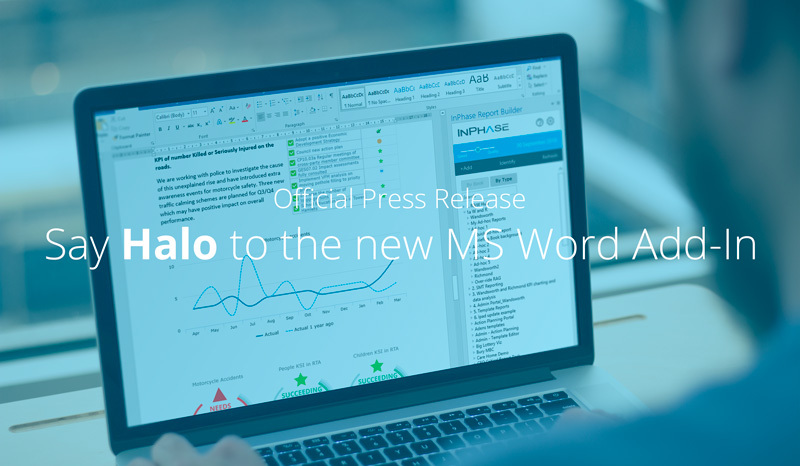 The InPhase Word-Add-In is a free to use app from the Microsoft Office App Store, but users will require an InPhase software license, login and implementation in order to connect it to data. InPhase is a business management suite that offers strategy, project management, budgeting, risk management, ideas management and much more inside a performance management and BI package. Started in the early 90s, with over 25 years experience, InPhase represents the latest frontier in business management, specialising in combining market leading functionality with ease of use.